The Elite program is a progressive camp with players at your level. This program is for H.S (Midgets), Bantam and Peewee’s. This is a goalie and player camp. 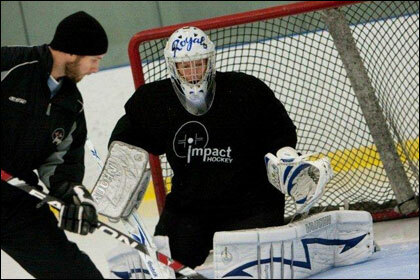 Some of the best H.S goalies in Minnesota have attended the camp at 60 times a year to prepare for the upcoming season. We call it the marathon run! 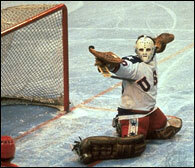 This is for a goalie that’s truly ready to take the next step in their game. You can create your own schedule to train at a price that’s hard to beat. Whether its 60 days or training or 10, it’s up to you. Dry land is included in the program. Our goal is to help you achieve better balance, a stronger core and footwork. Movement! Movement! and more Movement will be a part of this camp. High repetition is daily to make sure your game is where you need it to be. You need to recover properly, move laterally and control your depth to maximize performance. This is an application based program that starts in March and goes until mid November. The program will focus on your movement, save selection, depth control, mental toughness and a lot of battling. The best part about this intense training program is the small area games every session to prepare you for game play. Why should you do this camp? If you are looking for a consistent camp that will challenge you on a weekly basis, this would be a great place to come. It’s competitive, great training and will keep you moving at all times. This is not a camp for the mentally week.